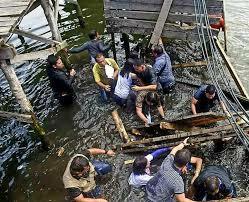 A controversial wooden footbridge in Zamboanga had collapsed when officials clamped in one segment for inspection. House Committee on Housing and Urban Development chair Alfredo Benitez said that construction costs of the viral wooden bridge cost P12 million. In a forum, Benetiz disclosed substantial information in the incident along with Zamboanga City Representative Celso Lobregat, Mayor Beng Climaco-Salazar, and other officials who fell into murky waters after footbridge collapsed. The wooden bridge has since been rehabilitated after the incident.